We know that early mornings are not popular on holidays, but we highly recommend that you make an exception so that you can enjoy the outstanding walk through the famous and beautiful Samaria Gorge, the longest in Europe. A breakfast stop on the outskirts of Rethimnon in the morning will wake you up for the rest of the day. You can also make a short stop in the Plateau of Omalos for last minute supplies. The 18 Km hike starts in Xyloskalo. You will discover a wide variety of fauna and flora, much of which is unique and found exclusively on this island, and you will also see the Kri-Kri, the wild Cretan goat. The ever-changing view and the wonderful scent of pinewood and Cretan herbs make this walk, which is rocky at some points, a wonderful experience and make all the effort worthwhile. The isolated, deserted village of Samaria makes the ideal place for a rest before you continue to the ‘Iron Gates’, the point where the canyon walls are so close that they almost touch each other. Enjoy the fantastic rock formations and take advantage of this unique chance to taste the fresh, cold spring water. The walk ends at the small fishing village of Ayia Roumeli, with plenty of tavernas for you to enjoy a tasty meal and that well-earned drink. Relax on the beach and cool off in the turquoise waters of the Libyan Sea, before taking the boat which follows the coastline to the village of Chora Sfakion where the coach will be waiting to take you back to the resort through the scenic route via Imbros Gorge and the Plateau, and the villages of Askifou and Vrisses. *Not suitable for the unfit or people with walking difficulties. 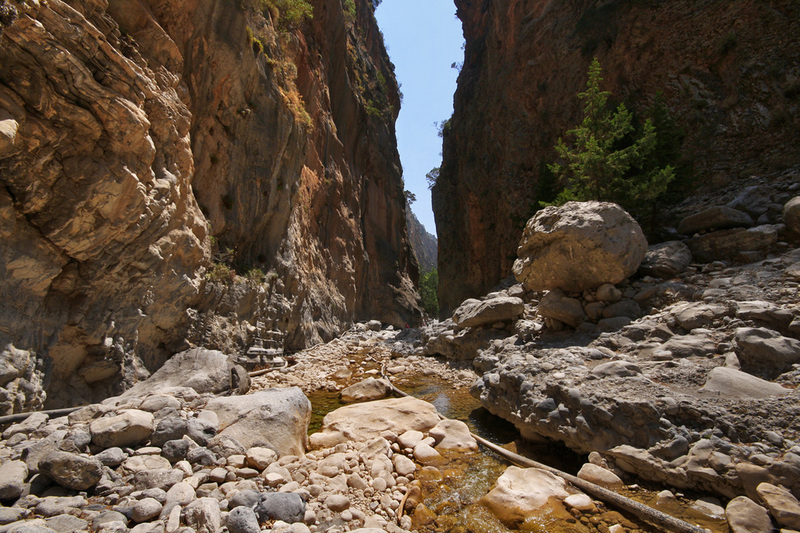 *In the unlikely event of a last minute closure of the Samaria gorge for security reasons, due to unexpected and unpredictable weather reasons, the excursion will be diverted to the another amazing gorge in Crete which is close to Samaria Gorge, the Impros Gorge.